Spring migration is one of my favorite times of the year. On Wednesday, I added 10 new birds to my year list of birds. Thursday I added six more and then today, Friday, I added an additional 11 birds. They just keep coming and it makes it a fun time of year. One of the birds I look forward to seeing every year is the Rose-brested Grosbeak. People sometimes ask about the name, Grosbeak is derived from the french grosbec. Gros is simply old French for large. The moniker sure fits these beautiful birds. While at the Lee & Rose Warner Nature Center this morning I checked out the feeders to see what was there. There were numerous Rose-brested Grosbeaks but one caught my eye. This is a female, though her coloration is aberrant. She is exhibiting partial leucism which I have written about before in other species. Leucism is distinct from Albinism. Albinism is the total lack of pigment in the body. An albino bird would have all white feathers, pink legs and pink eyes. A leucistic bird has regular colored eyes and legs and the feathers are either paler or they have white patches. The cells of a leucistic bird are damaged and cannot make the pigment necessary for the coloration of some of their feathers. Only the affected cells are white and leucism only affects feathers, which is why the legs and eyes remain the correct color. In contrast, albino birds lack the pigment melanin in all of their cells so their eyes and legs are also not the normal color. Albinism is systemic, affecting the whole body so you cannot have a partial albino. 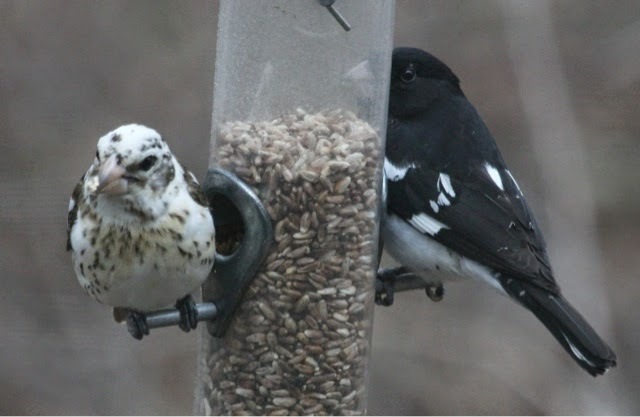 The partial leucistic grosbeak is interesting. You can see the breast still retains some of the yellowish-orange wash of a female but there is extra white, especially on the head and back. 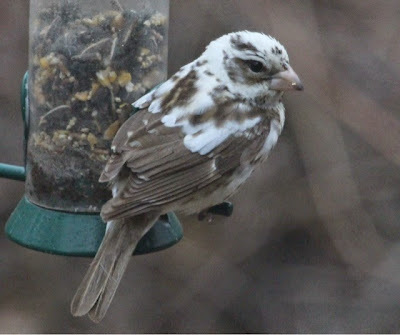 Hi Kirk - I enjoyed your story on the partial leucistic rose-breasted grosbeak. 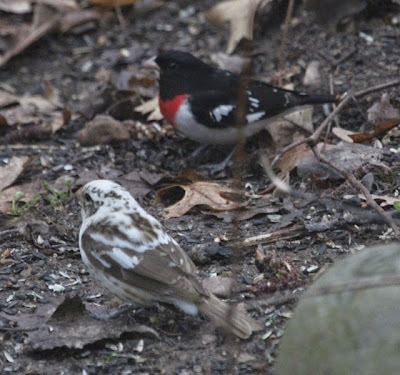 A few days ago, I spotted three Rose-breasted Grosbeaks, two male and one female, gnawing at a suet cake in my backyard on the southwest side of Chicago near Midway Airport. Is there a chance they'll stick around or are they just passing through? Such beautiful birds. Dan D.
Rose breasted grosbeaks should stick around Chicagoland area all summer long. If they can find food and habitat you will probably see them again.